The seaside holds a dear place in my heart when it comes to travel. Growing up we weren't in a position to travel to far flung destinations, and so a trip to the seaside was our summer holiday. One of my favourite things when visiting the seaside was to look for treasures, whether that be in the sand or pebbles. Being a pebble beach in Brighton, the treasures are to be found among stones, and toddler took quite a shine to the stones on the beach. On our first night in Brighton, we took an evening stroll on the beach, and found a couple of my favourite kind of shells. This led to Alexander, my toddler, picking up stones each and every time we were on the beach - so at least once a day. It's funny in a way, because whilst I was looking for shells, he would happen upon the biggest stone nearest him and carry it around for a while before finding another 'nice' (his words) stone to grip on to, dropping the previous stone. It was quite cute really, and he enjoyed remarking on all the different colour stones he found and such. When we decided to head to Brighton for a little break, I knew we had to make a journey on the electric train that runs a portion of the seafront. Alexander is really in to trains at the moment, and so it was a no brainer making time for this activity. The train journey is relatively short in length - 12 minutes total, but there are some really pleasant views on route and children are really taken in by the whole thing. Our son actually cried when it was time to get off because he was enjoying himself that much! We opted to take the full train route - from the stop by the aquarium to the end stop of Brighton Marina, however in hindsight I think we would have just taken half the route as there is a play park at the half way station. Although, I do think it's important to experience the full route at least once. The trains run frequently, with a new service every fifteen minutes, and prices are super reasonable with children under 3 travelling for free. As my son is only a toddler, the activity was very much about going on a train, however if you have an older child it might be fun to explore the history of Volk's Electric Railway as it is quite interesting reading about how it has evolved. All information regarding Volk's Electric Railway can be found here. Visiting an aquarium is kind of a fail safe with children - we've been to an aquarium with toddler once before and so we knew he was sure to have fun. SEA LIFE Brighton has a good variety of activities to be found inside, including interactive exhibitions as well as a number of shows and talks that take place throughout the day. Alexander had his first experience of a rock pool - touching a starfish - and found himself a little nervous of the quick movements from the turtles, even jumping back when they came close despite a tank being in the middle of him and them. He soon came round to the turtles though as in the gift shop he opted to take home a turtle soft toy as a souvenir. We visited the aquarium with Polly from Our Seaside Baby and our two boys got on really well. The aquarium is a great place for an inquisitive toddler, with plenty to see, and plenty of room to run and roam. If you were looking for more information regarding SEA LIFE Brighton, you can find that here. 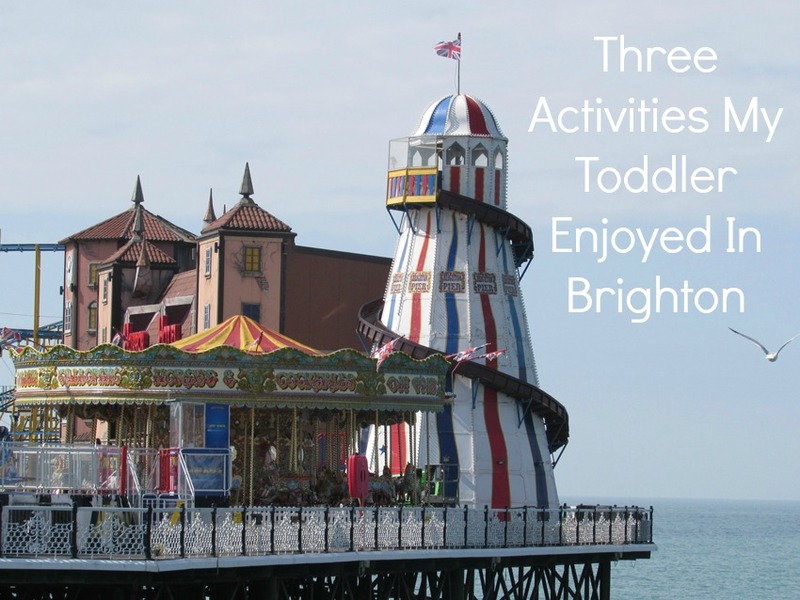 There is plenty to see and do in Brighton, with these three activities being just a snippet of how we spent our time in the family friendly city. I'd like to toddle along with you! What a lovely, sweet post, Jade! Indeed it makes us happy to see (our) children happy. Brighton is definitely a city I would love to visit. Thank you, Sara! Children's joy is infectious! I agree, Tasha, and every experience of it feels like a whole new one because you never know what you'll find! The pebble beach was a new experience for Alexander - we've been to the beach locally here but they are sandy so he had a lot of fun with treasures on Brighton beach. Haha - I knew the train would be a hit with him because he loves trains (as you saw with your littles ones toy trains) but I didn't quite expect the tears getting on and off! Also, we picked him up a couple of the Thomas trains and he LOVES them - he got Thomas and Rosie. It was so nice to meet you and your son - I'm glad we were able to do that, and thanks for showing us around a little! Pebble collecting seems to be quite a hit with the little ones... Even as an adult I can see why! !